Many years ago, my Aunt Jane, then a teenager, was tasked with preparing the grand finale of the family Thanksgiving meal: the pumpkin pie. 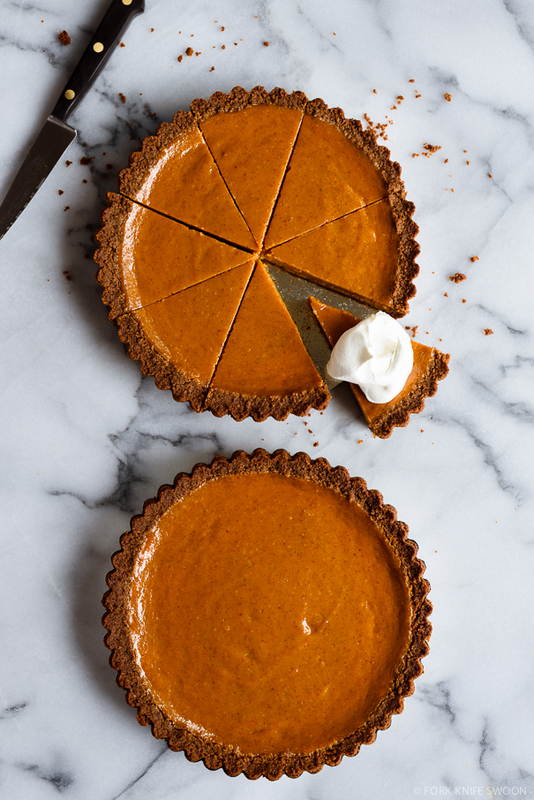 She followed the classic Libby’s pumpkin pie recipe, the one from the side of the can, but made a small mistake, accidentally substituting sweetened condensed milk for the evaporated milk called for in the recipe. Well the pie turned out so creamy and indulgent that the mistake stuck, and since then, Thanksgiving dinner is not complete without her pumpkin pie, still made the “wrong way,” each and every year. This pie starts with Jane’s tried-and-true version of Libby’s recipe, but… I fiddled with it a bit, as I’m generally wont to do. Our family is very traditionalist when it comes to our fourth Thursday in November feast: (Overly large) turkey, oyster dressing, cornbread, sausage and apple dressing, candied yams, creamy mashed potatoes and my Grandma’s (and now Dad’s) out-of-this-world homemade turkey gravy, cranberry sauce and jelly, some sort of green vegetable side dish, an olive and celery plate, and Mom’s famous pumpkin bread… Everyone overeats, but still leaves room for a slice of, you guessed it, pumpkin pie, with big dollops of whipped cream. While we don’t really deviate much from this annual menu, I think there’s always room for a small amount of tinkering with the recipes themselves. 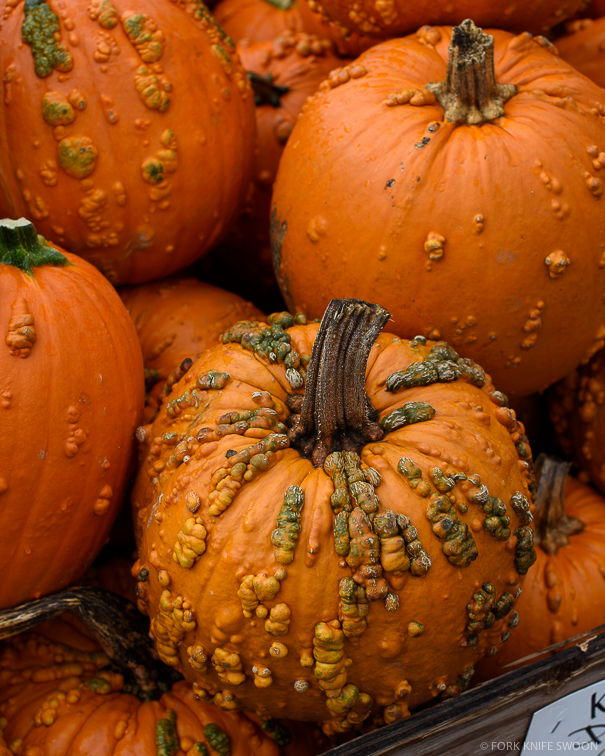 I knew one thing for sure – the boring, plain old pie crust that accompanies almost every pumpkin pie ever, had to go. First thing. 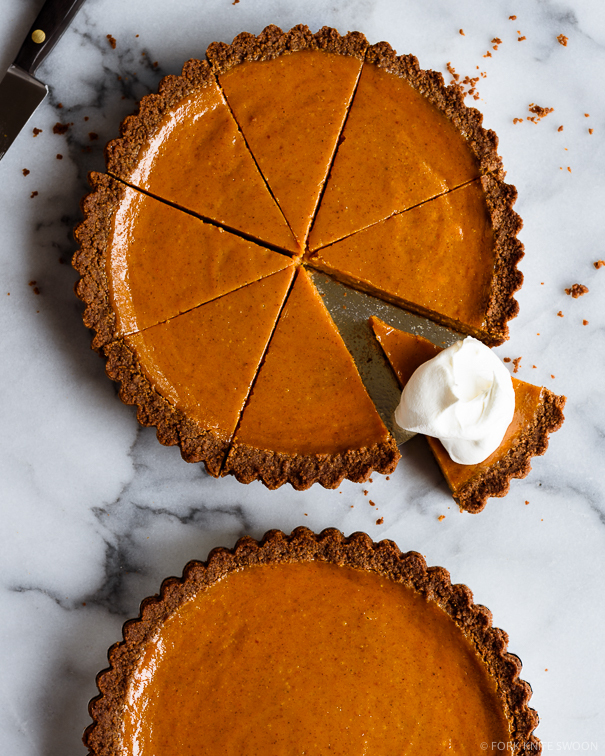 Instead, the pumpkin pie I imagined called for a fabulous, spiced gingersnap cookie crust, the perfect complement to the sweet pumpkin custard filling. Next, cooking the pumpkin purée with the sugar and spices prior to baking evaporates some of the natural liquid in the pumpkin, but more importantly, thickens and slightly caramelizes the custard base, deepening and intensifying the flavors of the pie. Many pumpkin pie recipes call for heavy cream, but I kept the sweetened condensed milk for nostalgia’s sake (while cutting back the sugar a bit), and added an extra egg yolk for creaminess. It took no less than eight iterations to get this just right, but oh, was it worth it. 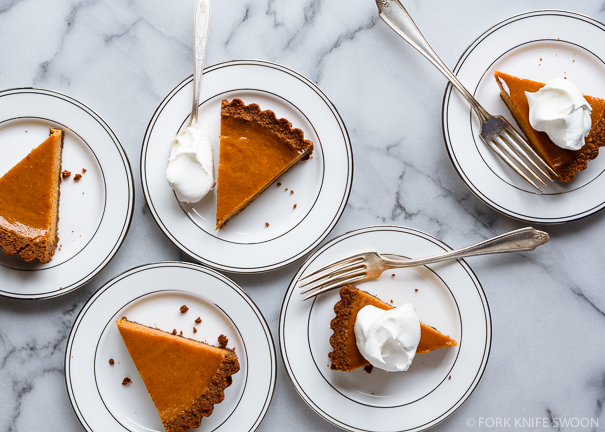 My final recipe has all the classic, nostalgic flavors I’ve come to expect from a Thanksgiving pumpkin pie (Jane’s original version), and is super silky, gingery, indulgently creamy pumpkin pie perfection, and destined to become another family-favorite. 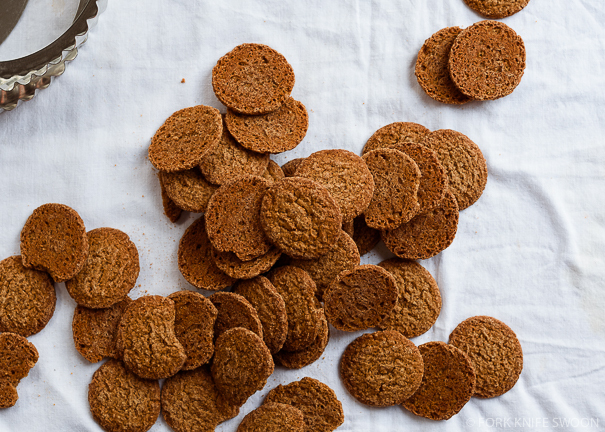 Make the gingersnap crust: Preheat the oven to 350 degrees F. In a food processor, pulse together the gingersnap cookies and brown sugar until you have a coarse crumb. Add the ginger and cinnamon and pulse once or twice to combine. Pour in the melted butter and pulse until combined. Spoon the crumbs into a ungreased 9-inch pie pan, or two 7-1/2-inch tart pans (with removable bottoms) and use your fingers to gently divide the mixture into an even layer on the bottom and sides of the pan. Follow with the flat bottom of a measuring cup or glass to firmly pack the crust into the pan. Bake for 5-8 minutes, then remove from the oven and let cool for at least 10 minutes. Meanwhile, make the pumpkin filling: Heat the pumpkin, sugars, ginger, cinnamon, cloves and spices in a large heavy-bottomed pot over medium-heat, until the mixture begins to sputter. Cook for 5 minutes, stirring regularly, until smooth and glossy. Remove from the heat and slowly stir in the condensed milk, whisking until completely combined. Whisk in the eggs and egg yolk, one at a time, whisking until completely combined after each addition. Stir in the vanilla. Pour the filling into the pie shell. Bake for 30 minutes, until the edges of the filling are just starting to set. Turn the oven down to 325 degrees F, and bake for another 25-35 minutes, until the filling is mostly set (the center will still be slightly jiggly). Cover just the crust with aluminum foil or a pie crust shield, as needed, if the crust starts to brown too quickly. The filling may bubble and puff up slightly as it cooks – that’s okay, it will settle as it cools. ¹Graham cracker/cookie crusts are a challenge to write recipes for, and I’ve gotten many questions over the years about this. There are a lot of variables – the brand of cookie, how finely you crush/crumble them, how firmly you pack the crumbs into the measuring cup, the density/sugar/moisture contents of your cookies, heck even the humidity in your kitchen probably comes into play. All these different factors demand different amounts of butter to moisten/hold together the crumbs without becoming greasy. This recipe was originally tested with MI-DEL gingersnaps, but I’ve used other brands with success. This is the ratio that works for me, but use your best judgment. A few tips: the cookies should be crumbled to the point of resembling coarse sand. You don’t want to pulverize them completely into powder. Pulsing in a food processor works well. Don’t worry if there are a few larger bits of cookie here and there. You’ll end up with about 2 to 2-1/2 cups of crumbs. Because there are so many different brands of gingersnap cookies, use your judgment when it comes to the butter/crushed cookie ratio. 1/2 cup (1 stick) of melted butter may be more than you need depending on the particular gingersnaps you use. Start by adding about 6 Tbsp of the melted butter to the crumbs. If they aren’t coming together or don’t seem damp enough, add a little more butter. If they seem excessively buttery, add more crumbs, and so on. You want a crumbly, moist crumb that can easily press into the tart pan. Bake the crust(s) on top of a rimmed sheet pan to catch any butter drips. This is especially important if you’re using tart pans with removable bottoms. Depending on the cookies you use (and your oven), the crust may take more or less time to pre-bake. Crispier cookies may bake (and potentially burn) faster than softer varieties. If in doubt, err on the side of less time in the oven. The crust will continue to bake when you add the filling. Cover the pie (or just the crust) with aluminum foil if it seems like it is browning too quickly. 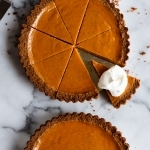 ²Make this pie gluten free by using GF gingersnaps – I (and several readers) have used the GF cookies from Trader Joe’s with great results. We made this and it was AMAZING. So amazing, that our neighbor who tried it asked if I could make it for her using coconut milk instead of condensed. Do you know if that’s possible? We made this pumpkin pie for Thanksgiving this year. I followed the recipe exactly and was so disappointed with how ridiculously sweet this pie is. The pumpkin and spice flavors were overwhelmed by the overpowering sweetness. All we could taste was sugar. Unfortunately, we could not serve it but it did feed our compost bin. If you make this pie, I highly suggest not adding the additional brown and granulated sugars to the filling. The condensed milk provides enough sweetness. I’d also suggest halving the amount of sugar in the whipped cream as well. This recipe surprised me. I hadn’t ever made pumpkin pie where the filling is cooked ahead of time, but boy, what a wonderful texture. I made one big mistake – I misremembered the recipe and reversed brown sugar and white sugar quantities (so put in 2/3 cup lt brown and 2T granulated). The outcome was a much-too-caramel and not pumpkiny enough flavor, but that’s my fault entirely, and the pie still tasted good. I will definitely make this again. I did use evap. instead of condensed milk and it was plenty sweet. The filling was a bit soft, so next time I’ll use the evap again and probably add one more egg yolk just to tighten it up some. I’m not used to cooking with condensed milk, but think there is more density to it than evap. If that doesn’t work as planned, time #3 I’ll reduce the sugar and go with condensed. Testing this recipe is going to be sooo tasty! The crust, btw, is wonderful. I baked it in a glass pie pan so I buttered the pan lightly and it worked really well. I was slightly short on gingersnaps so I toasted about 1/2 cup of pecans and ground them with the cookies. It worked just fine, but the pecan flavor was overwhelmed by the ginger flavor, so I wouldn’t recommend it as recipe improvement. I’m a great fan of pumpkin pie, and this one absolutely rocks! Hubby loves it too. Thanks for a great recipe. Lots of compliments on this pie when I made it for Thanksgiving this year! I personally likegetting more of the actual pumpkin flavor of a basic recipe like libbys a little more so I am going to try and use this recipe with less added sugar next time(and more spices as I usually do add more spices to any pumpkin recipe i find bc most don’t have as much as I prefer) and see if it turns out still. Other than that the texture and the flavor are amazing, I have still ended up eating the bit that didn’t fit in the pie pan and the leftovers because it is still delicious! The pie was wonderful. Except for one thing. 2/3cup of granulated sugar AND a whole can of condensed milk?! I had my doubts but I tried it anyway. Although I only added about half the can of condensed milk. The pie was silky BUT way way too sweet. I recommend using either the sugar or the can of condensed milk. Not both. I would also add another egg yolk and a bit of heavy cream. The pie did come out beautiful, deep orange color and no cracks. I used biscoff cookies for the crust and it was perfect. I really enjoyed making this pie and Laura’s detailed instructions were easy to follow. This was my first time making a cookie crust and it turned out perfect. I did find the filling quite a bit too sweet for my taste, so next time I’ll probably significantly reduce the granulated sugar or leave it out all together. Thanks for the recipe! I first used your recipe for this pie a few years ago at our family Thanksgiving meal, and my grandkids couldn’t get enough of it. Every year now it is a must have item at Thanksgiving dinner. I had to make two this year! My son and his wife took some home for leftovers . I think the gingersnaps really compliment the traditional pumpkin pie flavors. Anyway, thanks for the recipe, my family and I are certainly fans.